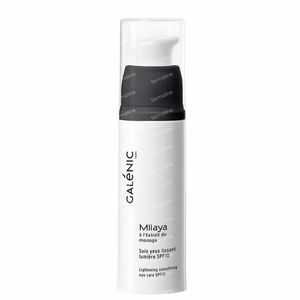 Galénic Milaya Cream Eye Contour Area 15 ml order online. Melting and moisturising* Revitalising Radiance Eye Care smoothes and reduces the look of fine lines around the eye contour. Protects the delicate skin of the eye contour area. Brighten the look of your eyes. * Provides hydration of the upper layers of the skin. Use daily. Apply to eye contour and crow's feet in the morning and/or at night by gently dabbing into targeted areas. WATER (AQUA). OCTOCRYLENE. ISODECYL NEOPENTANOATE. C12-15 ALKYL BENZOATE. CYCLOMETHICONE. DIETHYLHEXYL BUTAMIDO TRIAZONE. GLYCERIN. BIS-ETHYLHEXYLOXYPHENOL METHOXYPHENYL TRIAZINE. ARACHIDYL ALCOHOL. GLYCERYL STEARATE. PEG-100 STEARATE. ARACHIDYL GLUCOSIDE. BEHENYL ALCOHOL. BLUE 1 (CI 42090). CAPRYLYL GLYCOL. DEXTRAN SULFATE. DISODIUM EDTA. FRAGRANCE (PARFUM). HYDROXYETHYL ACRYLATE/SODIUM ACRYLOYLDIMETHYL TAURATE COPOLYMER. ISOHEXADECANE. MALTODEXTRIN. MICA. MORINGA PTERYGOSPERMA SEED EXTRACT. POLYSORBATE 60. POTASSIUM SORBATE. RED 33 (CI 17200). SORBITAN ISOSTEARATE. TIN OXIDE. TITANIUM DIOXIDE (CI 77891). TOCOPHERYL ACETATE. XANTHAN GUM.